When Dylan contacted Hog Roast Chester a while back, it was to book one of our highly tasty hog roast centrepieces for his brother Sam’s milestone birthday party. We have amazing feedback on these scrumptious offerings and repeat custom due to our top-notch service as well as our food but we don’t only cook hog roasts to perfection – we can also provide much more for all kinds of events and parties too. Whether you need catering services for your wedding, private party or business function, we have a fantastic assortment of dishes to cater to everyone’s tastes but we also offer many that are suitable for particular diets as well, meaning everyone invited gets to eat our delicious food. For Sam’s 50th birthday, as well as asking for a hog roast for us to make our famous pigs in buns, Dylan also asked us to prepare a vegetarian option for one guest and a gluten-free option for another. These days, we are often asked to cater these diets, and it’s never an issue. We have several choices for vegetarians, such as stuffed peppers or mushrooms, quiches or burgers, but our most popular dish is our grilled veggie skewers, with halloumi and several vegetables, which is what Dylan asked us to cook. The gluten-intolerant guest would be able to enjoy the same pigs in buns as the rest of the carnivores, just with additional gluten-free bread rolls, as the rest of the ingredients are actually already suitable. The day of the party recently came round and our Hog Roast Chester chef and team made their way to Dylan’s house in the morning, as this was the venue. We set up our equipment in the large back garden, in-between the DJ area on the patio and the bouncy castle there on the grass to keep the kids busy (as well as some adults!) Before long, we had a juicy hog sizzling away for a few hours. By lunchtime, the party was in full swing and Hog Roast Chester was busy serving the 40 guests plenty of lovely food, and many came back for seconds or more. 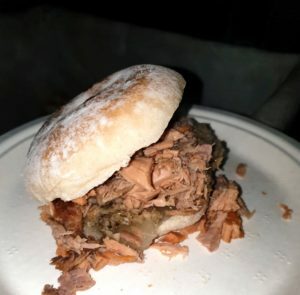 Hog Roast In Sutton – Engagement Party!